...Debt investors are turning to ever-murkier areas of the debt market, despite warnings from former Fed Chair Yellen and others who have expressed concerns about the systemic risks posed by the $1.6 trillion in outstanding leveraged loans, where rising interest rates could trigger a spike in defaults. 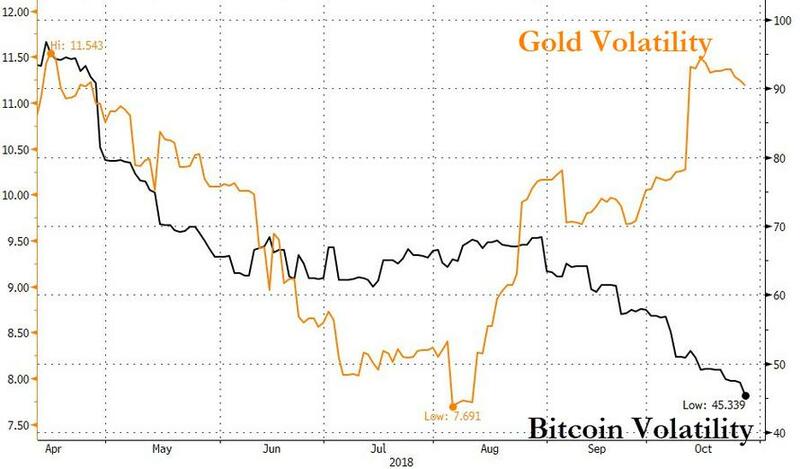 And in the latest indication of just how irrationally exuberant investors (and, more to the point, the bankers who are enabling them) have become, Bloomberg reports that bitcoin-focused companies are using some of their assets as collateral for junk syndicated loans that allow investors in risky debt to gain some exposure to the asset bubble du jour of yesteryear - aka cryptocurrencies, which have remained mired near their lows even as other alternative currencies (gold) have seen prices - and volatility - picking up. Coinmint, which is in the process of converting a disused aluminum smelter near the US-Canada border formerly owned by Alcoa into the world’s largest digital-currency mining center, has decided to fuel its ambitious expansionary plans (even as crypto prices have sagged far below their highs from late 2017) with a $50 million loan over 5 years to purchase and install servers and miners at its sprawling mine. For the privilege of borrowing, the company, which has negligible revenues given that it's key asset - the crpto mine - has yet to open for business, is willing to pay 12% a year in interest, according to BBG's sources. Coinmint's smelter-turned-mine in Massena, NY. 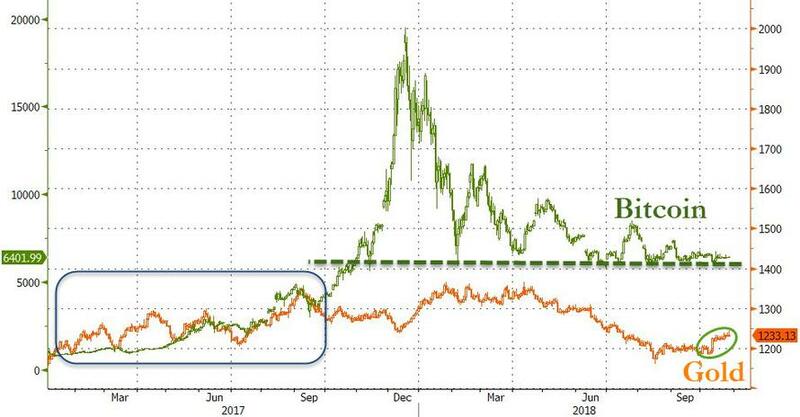 As BBG points out, the high rate and the opportunity to gain crypto exposure (which could pay off if bitcoin prices ever embark on another bull run) could entice lenders, despite the obvious risks. 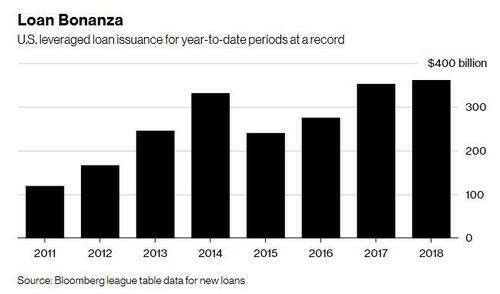 While the amount the company wishes to borrow is small by credit-market standards, the interest rate for the senior secured revolving-credit facility may entice lenders. Coinmint has proposed an interest rate of as much as 12 percent a year, a person familiar with the matter said, which is higher than the average yields on the lowest-rated U.S. junk bonds. The loan is a rare opportunity for credit investors to gain exposure to digital currencies, which remain largely isolated from traditional financial markets. In spite of the risks, it’s also a way to bet on the viability of crypto assets, which have had a torrid year, with some tokens plunging as much as 90 percent. “When you’re talking about lenders getting into a new space that they’re not as comfortable with, they will look at us as higher-risk, and use that as an excuse to charge higher rates,” said Prieur Leary, co-founder of Coinmint. He declined to comment on the specific terms of the loan. What's more, Coinmint is hoping to invest $700 million in launching its mine, which means a return to the debt trough is likely, if not inevitable. Coinmint said earlier this year it would invest up to $700 million in revamping its Massena plot, which was an active smelter for Alcoa Corp. until 2014. The new loan facility will form part of this funding, Leary said. And unsurprisingly given that simply creating and selling digital tokens to raise money has suddenly gone out of vogue amid a crackdown by the SEC, Coinmint isn't the only crypto firm looking for funding in traditional capital markets. Coinmint isn’t the only crypto company to seek to finance its growth in the credit market. Debt was also part of a recent round of finance for BCause LLC, a U.S. mining and trading company, according to founder Thomas Flake. But despite the risks, the bankers who put these deals together have every reason to celebrate: After a series of major booms and busts, and with crypto prices stuck in the toilet, at least they have found a way to profit off crypto in 2018.